Today @Wembley: How Suspected Assassin Of Undercover Journalist- Ahmed Hussein Suale Bolted. Was There Arrest Or No Arrest? I haven't seen a monk drunk to a stupor here yet. But I've heard that those that go to Wembley surely get drunk as a skunk. The varieties served here are mouthwatering. They include-- tequila, vodka, rum, baiju, 'Alomo' bitters and, 'Akpeteshie', the local distilled drinks and many more. And, if you happen to be at Wembley, chances are that you might escape police arrest and go awol. Now you know, this isn't your usual Wembley Stadium in London, UK, which hosts major football matches. This Wembley, is where people get pie- eyed. A popular tavern tucked deep in the heartland of Ghana's capital. The pub which is noted to be patronised by 'miscreants and drug users' is located near Kotobabi ---a suburb of Accra. Remember what Kwame Baffoe (aka Abrronye DC) NPP acting chairman Bono East said on the national TV about a suspect who'd been granted bail at the Kotobabi police station? On Tuesday 2 April, for the first time in about three months at a press briefing, the world got first-hand information from DCOP Maame Yaa Tiwaa Addo Danquah, head of Criminal Investigations Department (CID), regarding Ahmed Suale's murder case. Even though there appeared to be an arrest made at Wembley, that arrest went bizarre, the CID Boss told the press. Courtesy of Ghanaweb, I saw a video of that press briefing. It was held at police headquarters in Acca. A must-see video of course, but I think it didn't last long on the website. I suspect it's been taken down. First, the Facts: On the 20th of March 2019, a suspect linked to the murder of Ahmed Hussein Suale was arrested at the Wembley drinking bar, according to the CID Boss. The said arrest that never was, she said followed a tip off by an informant who'd gone to the Kotobabi police station to inform them that he'd seen the suspect at the tavern. That was the supposed suspect Abronhye was referring to. He was an informant and not a suspect. But in no time a phone call came through at the Kotobabi station, that the suspect at Wembley was about to leave the spot. So, the officer on duty at the time had to rush to the bar. While on his way he called for a back up (patrol team) but they arrived late to effect arrest, DCOP Addo Danquah disclosed. However, there was another police officer at the bar who assisted his colleague from Kotobabi to arrest the suspect. "They actually arrested this person, then he started struggling with the police officers so they let him go." "..Surprisingly the people at the bar came to the aid of the suspect.The police were not armed and sensing danger they left the suspect," says the security chief. How does that statement sound in your ears? Two police officers went to arrest a suspect in a murder case and we're told they weren't armed. In her bid to set the records straight the CID Boss shot herself on the foot. And I find her explanation quite contradictory and embarrassing. Not only that the account on the arrest doesn't seem to add up. First of all, let's try to breakdown this big word- 'Arrest'. To arrest means seize,(someone) by legal authority and take into custody. So if the police really arrested the suspect it is more likely that he was handcuffed. Unless he (the police officer) went to the pub with no cuffs. Apart from the fact (as we've learned) that the officer from Kotobabi police station wasn't armed. So granted he didn't take cuffs too, then how was he going to arrest the suspect?
" It is not accurate that the suspect was arrested at Kotobabi police station and the officers granted him bail. If it's true then we would likely have a surety." That's very true. The incident didn't happen at Kotobabi it happened at Wembley. And she's right about that. But the crux of the matter is: How did the suspect get away with an arrest? Does the CID Boss want us to believe that there were no patriots at Wembley that could have helped the police too? Remember someone had call from Wembley that the suspect was trying to leave. How does one get a bail? To be granted bail means one will be able to go home until one's court hearing. It also means you might agree to conditions like living at a particular address. In this case there was no address, so there certainly will be no bail neither a surety. Overall, I think the CID Boss did well in her briefing but for the WEMBLEY blues Meanwhile, she's given assurance that investigations into the case were ongoing, adding the police were on top of their game. The CID chief also thanked the public. She said they've been very supportive and co-operative in terms of volunteering information. On the field of play at Wembley on Tuesday, were 13 key players-- not your usual 22 set. Kennedy Ohene Agyapong, Member of Parliament, Assin Central and acclaimed international journalist Anas Aremeyaw Anas. 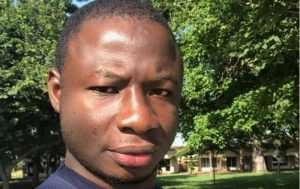 Eleven (11) others have been identified and questioned over the death of Ahmed Suale who worked for Anas' investigative firm-- Tiger Eye Pi, according to DCOP Addo Danquah. She was also emphatic about the non-disclosure of any further details given the fact that investigations are still ongoing. On Wednesday, the 16th of January 2019 at 10:05 pm Ahmed Hussein-Suale, was shot three times in his BMW at Madina, Accra. He was rushed to Pentecost hospital but was pronounced dead upon arrival. Mr. Suale played a major role in the investigative piece of Anas’ Number 12 that bothered on corruption in football.